It seems pretty amazing to me that this lovely painting was regarded by Richard Ansdell as one of his ‘not-so-quite’ important works of art -this is indicated by the fact that he only signed it with a monogram and not a full signature - quite neatly and artistically, I have to say – on a boulder to the lower right – but a monogram nonetheless. I have seen this painting in all its glory after it had been lovingly brought back to life by the Lancashire Conservation Studios at Preston, who have been responsible for saving quite a few Ansdells in the Lytham St Annes Collection. These paintings are displayed for public enjoyment every so often. It is satisfying to think that this was the original intention of the donors who so generously gifted these pictures so long ago to the people of the Borough. Their wishes have become a reality only during the last decade: until then the paintings were stored away or were hanging unseen by the general public. The Lytham St Annes Art Collection is amongst one of the finest town hall collections in the country due to the fact that the town became very prosperous in the mid-1800s, being a popular seaside resort and home to businessmen and merchants from Manchester and Liverpool with easy access via the newly built railways. As a consequence, a desire to promote the cultural importance of the town resulted in the development of an art collection comprising of works donated by these industrialists for the benefit of the townspeople. This painting was donated by Ward Mosedale in 1935. It is only fitting that amongst the Collection are some very important Ansdells as Richard Ansdell and his family lived in and loved the town for a few years – the relevant district is named after him to this day. At the time this picture was painted Ansdell was getting very familiar with the Scottish Highlands and tried to go there every summer, eventually building his own lodge at Laggan in 1870. He enjoyed going out with the shepherds and recording in sketch and paint many scenes from their working day. In the Highlands might well have had a more succinct title originally but that has been lost. To my eyes it is a perfect composition with the sheep sheltering behind the boulders – sheep and boulders are beautifully painted reflecting Ansdell’s love of both; the Scottish Black-Faced Primitive sheep so realistic that you can almost feel their huddled warmth and the rocks, never boring, displaying moss, lichen, heathers and scrub in the finest of detail by such a delicate hand. After Ansdell’s death many practice studies of similar rocks were found in his studio – he loved the colour tones and the angles that they presented. 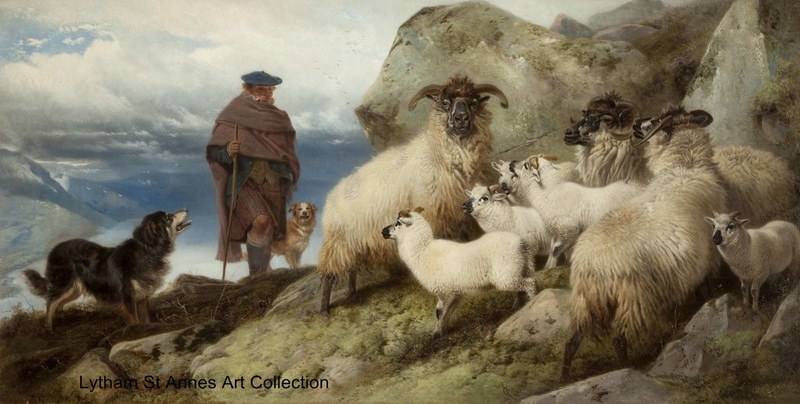 Of course he excelled at sheep and if you were to see this painting 'in the flesh' you would note the brightness in their eyes, the lambs’ tongues protruding in mid-bleat and the light glinting on horns and noses, not forgetting the sumptuous portrayal of the fleeces at which Ansdell excelled. There is a slightly edgy feel to the flock as they eye the Highland shepherd and his two collies. 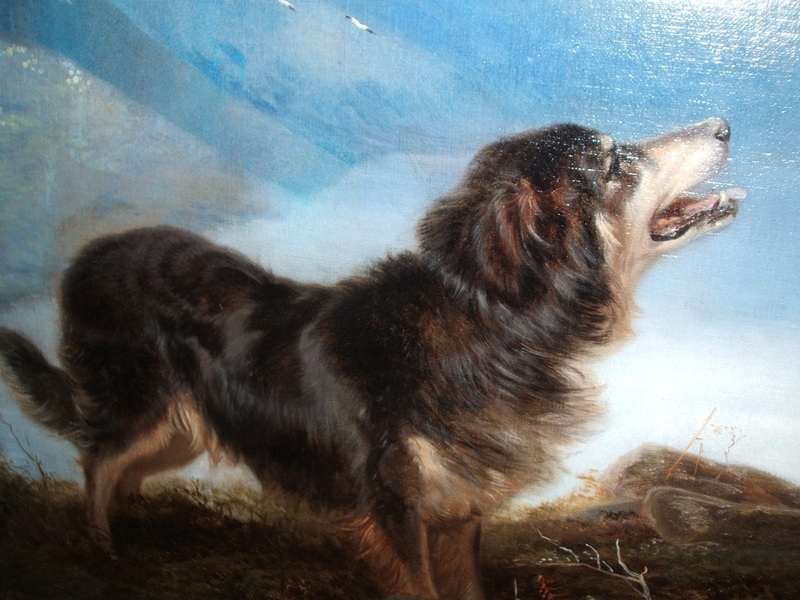 These two dogs are often portrayed in Ansdell’s paintings and the tri-coloured one was a family pet. The other gives interest with its recessive yellow coat. It is interesting to note the skill with which the tri-coloured collie has been painted. If you look at this close-up the detail is astonishing and the dog has been cleverly foreshortened, which isn’t as obvious in the main painting but is a very difficult and effective way of putting a subject realistically into a landscape. And what a landscape! The loch way below gives such a dramatic sense of distance, depth and atmosphere, surrounded by misty mountains and enhanced by birds wheeling overhead. Ravens and Atlantic Seagulls with black-tipped wings. I think this painting depicts the early spring return of the flock to higher ground after lambing on lower hills. It is still very cold as the shepherd is togged up to the nines – this is a routine visit as he is taking stock and enjoying the comfort of his clay pipe after the steep climb. The collies are waiting for their next command and the ewes are watching their every move as they are still very protective over their young. The new spring grass is yet to grow and the lambs are not newborn as they wouldn’t have had the stamina to return to such high ground. Thus we have this delightful scene amply displaying the natural connection between man, dog and sheep – a comfortable juxtaposition in a hostile environment. With thanks to Eddie McDonough for the devil in the detail.